The last 24 hours, or let's just call it the last couple of weeks, have been kind of crazy. After the iPhone 4S was unveiled, now we have two brand new top notch devices in the Android camp and a major update of Google's platform. You know what that brings up, right? We're talking about the eternal question for geeks: "Now, which one should I get?" To help you with the decision, we've neatly brought down all available information together in the spec comparison sheet below without missing the fractions of an inch difference in thickness, the cores and hertz, and everything in between. It's not all about the specs, though, so we should say that the Motorola DROID RAZR for once is the thinnest device out there, but it also comes with kevlar-reinforced back. The GALAXY Nexus is all about the 4.65-inch screen and Android 4.0 Ice Cream Sandwich, but it's also got a neat curved design. The Samsung Galaxy S II is the oldest among them, but still manages to stand out with not only proven performance, but also very thin body and Super AMOLED Plus display. The iPhone 4S looks the smallest among those big Androids - it's 3.5-inch screen pales when faired with the larger competitors, but it's got the benefit of Apple's thorough polish, extreme responsiveness and iOS 5, of course, coming with your personal voice assistant Siri. Now, that we've said that, let's get down to the pure specs. Take a good deep look, hold your breath and make a decision - you can vote right away in the poll below, and also later with your money if you buy the device. We'll announce the poll results on Monday morning, but don't wait until the last minute - every voice will count here. Now, which phone would you get? Apple, congrats....your phone is now, at best, the 4th best phone on the market. Just make sure it doesn't fall off the table. It'll be a shattered paper weight. 2200 votes in, and less than 200 for the i4s. not looking pretty. It has to come fouth,its last years phone after all,seeing as a huge load crash once the years warranty is up they do end up as paper weights! That saying with so many screen and battery faults with the iphone 4s it'll end up the same fast! sales??? lol. can you be more descriptive? everyone expects good sales from the iphone.. but its sales ARE slipping. The true test isnt initial sales, as we know the iFanatics will line up for anything with an apple logo on it.. its long term sales. Will it still be relevant in 3 months? 6 months? Once the "gotta have its" have their device, how will a sales rep convince someone to buy an iphone over a nexus or sgs2 when put side by side? If a customer doesnt get "the magic" of the iphone, why would they buy it? Before you spout off about how fast androids come and go, the SGS2 has been out for 6 months and has been the top seller from the moment it came out until this very moment and shows little signs of slowing. Had it been in america 6 months ago, it probably would have bagged 30-40 million sales by now. Either way, its an astounding success when it has 200 competitors with the same OS, much less its rivalry with iOS. iOS has 3 competitors to choose from with the same OS on it. Remix my friend, don't even bother. That is all the isheep have to defend their iphone. "Sales". Because there are a billion mindless sheep who go out and buy a new iphone on day one each year because they are under the spell of the hype and want to be cool and own the latest and greatest iphone that they think their device is better. Don't get me wrong, I enjoyed my time with the 4S but after just a few days, I was already missing the awesomeness of android. It's not that the iphone is bad, it's just not nearly as good. Just because something sells well, doesn't make it better. Hype, heavy advertisement, and popular name like "Apple" can make anything sell. Apple could sell the stupidest, worthless, most expensive product that doesnt do anything for you but put a Apple Logo on it and it'll sell like there's no tomorrow. so you already traded in your i4s?? wow.. that was fast. how would you compare it to android.. well.. ok.. as a long time user of android.. how did you feel about the experience. im curious. Its not about sells, its how it performs. People didn't buy the iPhone because of your jargons. Majority of the iPhone users do not understand or at least know anything about what you are talking about. They just bought it because it's 'the iPhone' and it has Apple logo on it. If people wanna play games they'd buy a gameboy, xbox or playstation. Prius is one of the best selling cars in the US, can you say that it's one the best ? hell no. Wow, that's a bulletproof argument right there. Lay down your Androids, fellas. All hail. For one thing, gaming is far from the be-all-end-all of a phone unless you're 13. I'm much more interested in smooth web browsing, email integration, maps, messaging and gee maybe making some calls. And even if all I cared about was gaming, wouldn't it be nice to game on a screen bigger than 3.5"? the OMAP4460 has a higher clocked PowerVR SGX540 and it's still pretty great. if all you care about is games then that's a true and accurate statement but i'd never get an iPhone for slightly superior GPU over the leading Android devices. Okay thechooz good point, mc Donald's does not make the best burgers. Now arqc12 the purpose of the modern smartphone is to be able to do more on one device, does that mean that your going to carry a 5MP point and shoot camera to take pictures instead of your 8MP camera on your smartphone. And people buy it cause it's a lot more user friendly for anyone to use, it's not complicated for a new user like android is. And every iOS device gets around 3 full point updates and it comes out for everyone at the same time, the top android phones only get 1 update if that and it's scattered throughout a 15month period. Roldefol check out this linkhttp://www.androidauthority.com/smartphone-users-play-games-more-than-listen-to-music-or-read-news-18756/ It talks about how games are what people spend most of there time doing on smartphones. And as for the 3.5" screen it's the perfect size for your thumb to reach the enitre screen with one hand (unless your shaq), which most users use there phone one handed most of the time, unless there typing. And that's why I mention AirPlay wireless mirroring for games movies and so forth. As for web browsing i find it smoother on the iPhone than on my brothers droid bionic. Email has always been perfect and simple on any ios device, maps and messaging also no problem there and phone calls on the 4S you ask, I haven't dropped one and they sound clearer. Thumpwhatever I wouldn't call 2X-5X more performance a slight bump. Now next I don't hate android, I own a SGT 10.1 LTE, think ICS is a great update, LTE is sick. 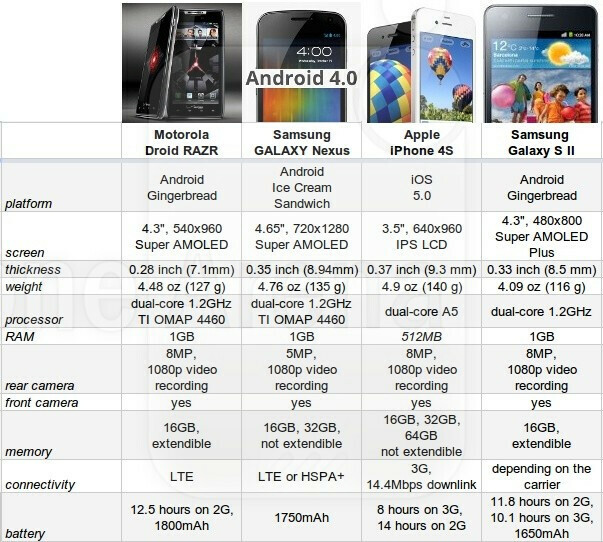 I like the battery life, and the thinness on the razr, I like the screen and ICS of the galaxy nexus, I like the CPU/GPU of the SGS2. If they combine all those features into one phone, then I would think about switching to an android smartphone. nick, did you even read the article you pasted in? It says nothing about people spending most of their TIME playing games, it says people download and pay for games more than any other type of app. I could download a dozen games, but that doesn't mean I spend all my time playing them. I'm going to spend most of my time on my smartphone browsing, reading articles, texting and e-mailing, and not one of those will require a downloaded app. As for that study on screen size, I agree that 3.5" is a good size for ergonomics, but I'd like to fit more on the screen, especially when browsing. oh yes ofcourse, it's always better to carry one device that does it all but at the moment, smartphones can't replace a real camera's quality and game console experience. most iPhone users play on their phone are games like AngryBirds that doest really need that much of muscle. the games you mentioned are appreciated by iPad users. now the updates you're talking about are like updates of nothing. you can't even recognize the difference between iOS 4.2.1 and 4.3.5. probably just some codes to block jailbreak for accidental updates for some of the users. but i admit having a non nexus android phone takes a while to get an update but it's not a biggie for me coz i'm a root user. Hey let's TEK it easy, If anyone asks me what the best phone is I would reply: whatever you like. If they ask me what's the Best truck, I would say whatever you like. These are all great phones and operating systems, none of them are complete or perfect. they will continue to push each other to feature better hardware and software through these coming years and benefit us, the customer. ... and Lady GaGa is the best singer. Preference people preference remember that. . . If people want the iPhone, they're going to get the iPhone. People who cross-shop Android and iPhone probably aren't looking at detailed specs, they're just going by device feel and ease of use.